Human resource management is all about increasing employee performance to their highest level corresponding to their role in the organization. Since every organization is made of people, HRM is all about acquiring services of people, developing their skills, motivating them to the foremost level and making sure that they continue to maintain their commitment towards the organization. In short, HRM is concerned with the management of employees from recruitment to retirement. 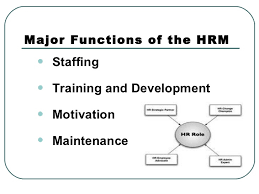 Although there are many functions of human resource management, following is the list of five major functions. Recruitment is the process of captivating, screening, and selecting potential and qualified candidates based on objective criteria for a particular job. The goal of this process is to attract the qualified applicants and to encourage the unqualified applicants to opt themselves out. Before starting the process of recruitment, the companies must execute proper staffing plans and should grade the number of employees they are going to need. Forecasting of the employees should depend upon the annual budget of the organization and short-term and long-term goals of the organization. Recruitment and selection process is very important to every organization because it reduces the costs of mistakes such as engaging incompetent, unmotivated, and underqualified employees. Firing the unqualified candidate and hiring the new employee is again an expensive process. Many organizations do not provide a thorough orientation to the new employees. This is the fundamental step to help a new employee to adjust himself with the employer and with his new job. Employee orientation program should include the objectives and goals of the organization and how the employee can help to achieve the long-term and short-term goals of the organization. Giving intensive orientation to the employee is one of the major functions of human resource management. The program should help the employee to know his assigned duties and his exact job description, job role, and the relationship of position to other positions in the organization. It gives clarification to the employee to take an active role in the organization. It is the responsibility of the human resource management to provide good working conditions to the employee so that they may like the workplace and the work environment. It is the fundamental duty of the HR department to motivate the employees. The study has been found that employees don’t contribute to the goals of the organization as much as they can. This is because of the lack of motivation. Human resource management should come up with a system to provide financial and non-financial benefits to the employee from the various departments. Employee welfare is another concept which should be managed by HR team. Employee welfare promotes job satisfaction. Employees are the pillars of any organization. Employee relationship is a very broad concept and it is one of the crucial functions of human resource management. It also helps to foster good employee relations. They have the ability to influence behaviors and work outputs. Management should Organize activities which will help to know an employee at the personal and professional level. Well-planned employee relations will promote a healthy and balanced relation between the employee and the employer. It is the key for the organization to be successful. Training and development are the indispensable functions of human resource management. It is the attempt to improve the current or future performance of an employee by increasing the ability of an employee through educating and increasing one’s skills or knowledge in the particular subject.